The Art Gallery of NSW is the leading gallery of art in Sydney. It is home to many fine works of art including both Australian and international pieces and both classic and modern pieces. It is one of the most beautiful art museums in the world and is located in parklands overlooking the spectacular Sydney Harbour. The Art Gallery of NSW began its life in the 1870s as the Academy of Art. The academy was established partly in response to the violent unrest in Europe and the concerns that fine art was being lost in the turmoils of war and instability. It was hoped that the Academy of Art could carry the torch of culture here in Australia through classes, lectures and exhibitions. Also playing a role in the formation of the academy was the traditional rivalry between Sydney and Melbourne. Melbourne had already established an art gallery in 1861 and it was thought it was high time Sydney had one too. The stunning classical building that is now the Art Gallery of New South Wales was not the gallery’s first home. In fact, it had several temporary homes before moving to its current location next to the Botanic Gardens. They included the Clark’s Assembly Hall in Elizabeth Street and the Garden Palace in the Botanic Gardens (which was eventually destroyed by fire). The building was designed by government architect, Walter Vernon and built between 1896 and 1909. Its design is early Greek in style and is intended as a temple to art. The interior is divided into large halls connected by pillared archways. 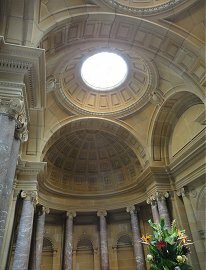 Close attention has been paid to providing adequate lighting for viewing the art works and the ornate details, particularly in the entrance hall, are well worth a look. The art gallery has been expanded on several occasions to make way for fabulous new collections including the Asian gallery and the Yiribana Gallery, a space devoted to Aboriginal and Torres Strait Islander art. The Art Gallery of New South Wales owns a rich and varied collection of over 30,000 art pieces. Of course, not all of them are displayed at once but you can be assured that you will have plenty of inspiring pieces to see. The permanent galleries include the following collections: Australian art, Aboriginal and Torres Strait Islander art, Asian art, Western art, Pacific art, Contemporary art and Photography. The Australian art collection is of particular interest as it documents Australia’s young history through art and features artwork by prominent Australian artists. Pieces dating back to the early 1800s as well as more contemporary works are on display, giving a real feel for changes in culture and art in Australia over the years. Also of significance is the Aboriginal and Torres Strait Islander art gallery. It celebrates the heritage, culture and art of Australia’s indigenous people and offers real insights into their traditions and customs. While the earliest work in the collection only dates back to the late 1800s, the stories told by many of the artworks dates back centuries and reflect the customs of the oldest continuous culture in the world. Temporary exhibitions are also run throughout the year and are usually based around a central theme. For example, they might focus on the work of one particular artist or pieces from a particular time and place in history. The annual Art Express exhibition is particularly popular and features artwork from Year 12 Visual Arts students. Temporary exhibits tend to last for 2-3 months and some attract an entrance fee. Please check with the Art Gallery Of NSW for a complete list of current exhibitions. 1. Self-Guided Tours – Audio tours are available at the Gallery Ticketing Desk or can be downloaded to your mp3 player in advance from the gallery’s website. There are several different tours to choose from including the Director’s Choice Tour in which the gallery’s directory talks you through his favourite pieces, the Curator Insights Tours in which a curator will talk you through a particular collection and the Kids Tour which has been specifically designed for the under 12s. 2. Guided Tours – The art gallery offers a range of free one hour guided tours led by trained volunteers. They include collection highlights tours as well as more in depth tours that focus on one particular gallery. Check with the gallery for running times. 3. Personal Tours – Personal tours can be arranged for a fee and must be booked in advance. The gallery’s goal is to educate and inspire and to that end, they offer a wide range of extra activities to enhance your experience of art. They include films, music, lectures, performances, exhibition talks, courses, celebrity talks and much more. They even have programs and activities specially developed for children and families. For example, you can pick up a Children’s Trail booklet that is designed to encourage your child to explore and engage in the world of art as you move through the gallery. Or you can take a child’s tour with a trained guide to introduce your child to art pieces through stories, games and interactions. If you have more time, you can also enroll your child in a workshop or class where they are tutored by professional artists in a fun and inspirational environment. General admission is free. Additional charges may apply for temporary exhibits. Entrance to temporary exhibits is free with a See Sydney Card. The Art Gallery Of NSW is located in the Domain, next to the Botanic Gardens and overlooking Sydney Harbour. It is a five minute walk from Macquarie Street. The nearest train stations are St James and Martin Place. Or you take the train to Town Hall station and take a bus. Bus 441 departs from the York Street side of the Queen Victoria Building (near Town Hall station) and will drop you off right outside the Art Gallery of New South Wales. If you are using the Sydney Explorer bus, the closest stop is Stop #12 (outside the Department of Lands). Limited meter parking is available on Art Gallery Road, Mrs Macquaries Road and other streets around the Art Gallery. Nearby parking stations include the Domain car park which offers discounted parking to gallery visitors on weekdays (you will need to get your parking ticket stamped at the gallery). Nearby attractions include the Botanic Gardens, St Mary’s Cathedral, Hyde Park, Hyde Park Barracks, the Archibold Fountain and the Australian Museum. 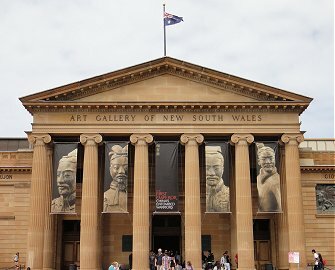 The Art Gallery of NSW is open 10:00am-5:00pm every day except Christmas Day and Good Friday. The gallery remains open until 9pm every Wednesday for Art After Hours. Food is available in the galleries café and restaurant. For a special treat, why not spoil yourself with High Tea at the Gallery Restaurant. Indulge in sweet and savoury treats as you sit back and enjoy a beautiful view of Sydney Harbour. The Art Gallery of New South Wales is wheelchair accessible. The wheelchair entrance is located at the rear of the gallery. You can contact the Art Gallery Of New South Wales directly on 1800 679 278. Have You Visited Art Gallery Of NSW? Please share your experiences of or questions about Art Gallery Of NSW in the comments box below. This entry was posted on Sunday, June 5th, 2011 at 12:28 pm	and is filed under Sydney Art Gallery. You can follow any responses to this entry through the RSS 2.0 feed. You can leave a response, or trackback from your own site. I was recommended this website by my cousin. I’m no longer positive whether this put up is written by way of him as no one else recognize such distinct about my problem. You’re wonderful! Thank you!